According to their creator, Mahisha Dellinger, “Gels are great for defining, defrizzing, and styling curls in place and are used from root to tip. Pomades are ideal for sculpting and slicking straight or curly hair in place. They are generally used for the first 3-4” of hair. For example, our customers use CURLS Passion Fruit Curl Control Paste to smooth down their edges and for slicking back their ponytails, buns, chignons, or any other protective styles. They use our CURLS Goddess Curls Gelle on freshly cleansed and/or conditioned hair to define and defrizz their hair. They allow the hair to air dry to create a wet, defined look or diffuse for a naturally defined look. The purpose of any gel is to enhance curl definition and hold the hair together from root to tip. A good gel will leave the hair defined and shiny with adequate hold. This particular gel has a strong hold without a stiff feel. Its unique quality is the botanicals, which means it uses natural, organic ingredients that rinse off easily with water and do not require a heavy shampoo. Like most gels, Curls Goddess Curls Gelle protects the hair from humidity to enhance and sustain curl definition. It provides all day protection and soft, touchable curls. The hold is created through styling polymers that cause the hair to attract to itself, forming clusters of softer curls. However, just because a gel is hard does not mean it is a bad formulation. The crunchy or smooth texture of the hair is simply a personal preference. Below you will see the purpose of the key ingredients in the CURLS Goddess Curls Gelle. A pomade formulation could also be called paste, putty, whip, or glue. Pomades of the past were usually beeswax or petroleum based for heavy styling. Although newer editions may contain traces of both wax and petroleum, other additives create a smoother, lighter finish. 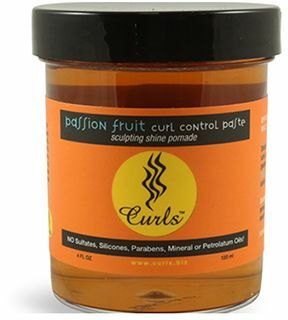 CURLS Passion Fruit Control Paste is also formulated with pure organic ingredients like shea butter & mango seed butter. It’s excellent for slicking edges in place for updo styles or ultra-defined curl styles. A gel is best utilized for a wash and go or other loose styles. A gel controls the hair and holds it in the place. Once dry, the cast it creates to hold the clumped curls together can be broken to release the clusters of curls from sticking to each other, allowing movement. Gel provides shine from light reflection and can usually last 1-4 days depending on the hair type. Pomades are designed for sculpted styles like ponytails, updos, or other coiffed looks. Its ability to lay hairs in an orderly fashion allots for enhanced shine and smoothness. While typically used at the roots and edges of hair, ladies with thick, coily hair could also use pomades for twists or wet styling to help lay down the hair shaft and enhance shine. Choose a gel and/or pomade without harsh additives that are difficult to rinse out. Look for nutrient rich ingredients in styling products. Our hair is more than cosmetic fodder; it is a part of us. Read the directions on the package for successful, best practices. How do you use gels and pomades? Do you use them together?